Following is a brief writeup on the hardware we recommend for your smart classroom or mobile recording setup. Epiphan VGA2USB converter (for screen capture), connects by VGA cable to presenter's laptop or VGA splitter, and by USB to your recording laptop. Powered by USB (no external power required), VGA cable sold separately in 10m lengths. Epiphan VGA2USB LR (shown in photo) is a higher quality professional converter for full motion graphics. An external DC adapter is supplied. 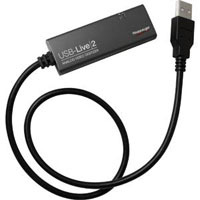 Hauppauge USB Live-2 (for audio and video capture), connects by RCA or S-Video cable to camera, and by USB 2.0 to your recording laptop. Also captures stereo audio. Breakout cable with 3x RCA connectors and 1x S-video connector included with the device. Powered by USB, no external adapter required. Works with Microsoft Windows 7 (32-bit or 64-bit), Vista or XP (service pack 2). Applied Research & Technologies USB Dual Pre is a complete, portable hardware interface for computer-based digital recording with two-channel mic mixer (for audio monitoring and mixing recording). Connects by USB 1.1 or 2.0 to your recording laptop. Powered by USB, no external adapter required. It will work with the USB audio device drivers built into Windows 98SE/ME/2000/XP/Vista/Win7 (32-bit or 64-bit) and Apple OS9.1/OSX computers with native USB support. No special drivers are needed. Kramer Tools VP-300N is a high performance HDTV compatible distribution amplifier for computer graphics video signals with resolutions ranging from VGA through UXGA and higher. It takes one 15-pin D-connector input, provides correct buffering and isolation, and distributes the signal to three identical outputs. A 12V adapter is supplied. Barix Instreamer 100 converts audio from any analog or digital device into high-quality MP3 streams. The audio is encoded in real-time, and the generated audio stream can be distributed, via an IP-based network or the Internet, to one or more receivers or Shoutcast/Icecast-servers. Canare 75 ohm precision digital video cable is a high performance low-loss cable that is lighter weight and more reliable that comparably priced traditional coax. Designed for digital video applications including HDTV transmission.